But although Rooney's character has been denounced by critics since the film's premiere in 1961, it hasn't stopped yellowface from appearing in popular culture--only this time, there doesn't seem to be many people denouncing it. While it is quite the achievement for Linda Hunt to be the first to win the 1983 Oscar for portraying a character of the opposite gender, the man she portrayed was a Chinese-Australian photographer. 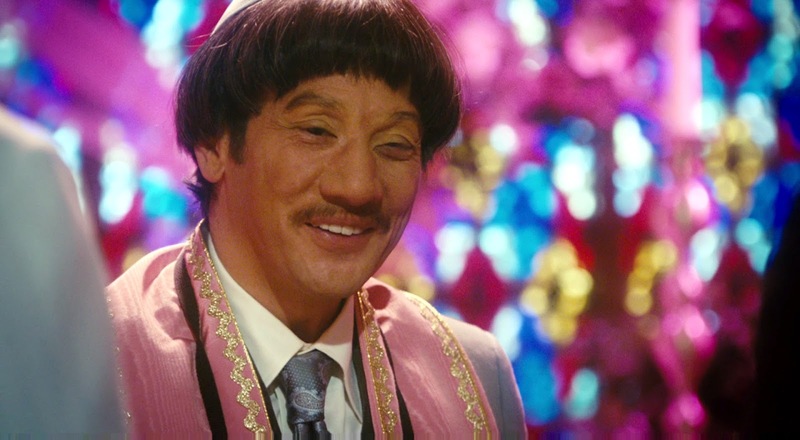 In the 2007 comedy I Now Pronounce You Chuck and Larry, Rob Schneider played an Asian minister, complete with slanted eyes, a wider nose, and darker skin. 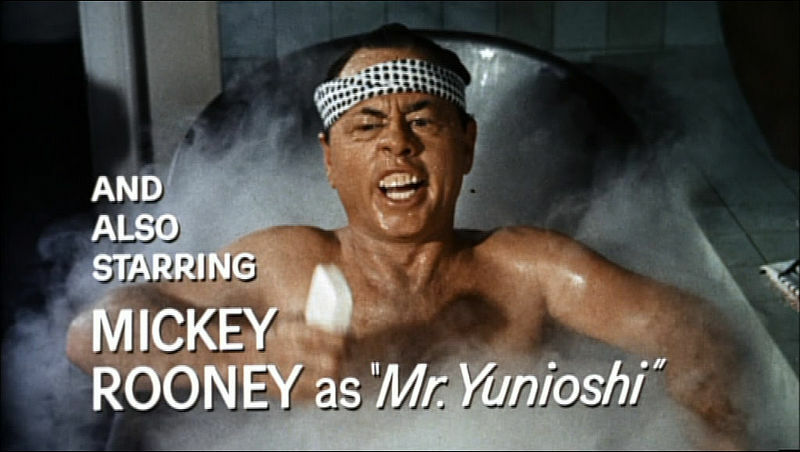 Schneider is a quarter Filipino, but apparently that didn't make him "Asian" enough for the role. And, most recently, Cloud Atlas casted non-Asian actors to play Korean characters--including Jim Sturgess, who previously starred in the 2008 film 21, the story of six MIT students who learned how to count cards and cheat the Vegas casino system. 21 was based on the true story of Asian-American students, but you wouldn't have gotten that based on the film. 2007: Rob Schneider in "I Now Pronounce You Chuck and Larry"
So, perhaps all of this just further proves that there needs to be more Asians in the mainstream in order to debunk the apparent myth that there are no talented Asians who deserve the spotlight in films, television, music, etc. It's disheartening when it has become the norm to simply accept that we will never be leading men and ladies. Take, for instance, this recent interview with Olivia Munn, who flat out says she will never be Wonder Woman because she is Chinese: "That's probably not what they would do. I don't know a lot of Asian-American women who are getting great opportunities yet, and the other actresses (vying for the role) are probably really famous and Hollywood tends to go for the girls who are already in the big movies." We continue to see a lack of representation in the mainstream media--this extends from entertainment to journalism--and, more unfortunately, a subconscious anti-Asian sentiment that runs beneath the conversation: "Saturday Night Live covered it best last week during the show's cold opening during a mock game recap in which three anchors made plenty of jokes about Asian Americans, but when one anchor tries to make a joke about African Americans, he's immediately stopped." This is a conversation that extends beyond eliminating yellowface as a practice in Hollywood in the 21st century, but until we can all agree that that's offensive and should be stopped, perhaps the conversation needed to break barriers is a long way away. I'd like to offer a humble defense of Cloud Atlas. In the film, Jim Sturgess plays 6 roles, and one of which is implied to have Asian heritage (because of the futuristic setting of the sub story, it is implied that he and many others are of mixed white and Asian heritage due to geopolitical shifts, which could account for him having some Asian features but still "looking white"... or, it could just be bad makeup). His costar, Doona Bae, an actress of Korean descent, plays an Asian character, a privileged white woman in mid-1800s America, and a Hispanic lady paid as a lookout for an underground crime ring. Halle Berry, an African American woman, plays a German Jew in the early 1900s and an older Asian man in the future. These portrayals are not played for stereotypes, and these actors were not cast because of an aversion to casting actors of Asian descent. The repetition of actors across time, gender, and race is designed to underline the film's themes of reincarnation and interconnectedness.